Planetary gearing is a gear system consisting of one or more outer gears, or planet gears, revolving about a central, or sun gear (wiki). This layout makes gearboxes compact. Ore than one stage can result a big ratio in very small case. Neugart build only planetary gearboxes in Germany. 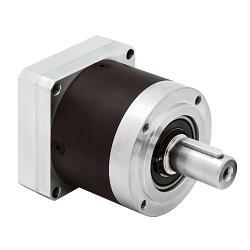 Planetary gearboxes have low backlash and high degree of efficiency. All series are available in N and Ε type. E is the economy version. Ν type bachlash is less than 1 arcminute in PL and PLF and the degree of efficiency is ~98%. Noise leves are very low and it is maintenance free.